Se'Darius Blain as Woody and Miles Teller as Willard in FOOTLOOSE, from Paramount Pictures and Spyglass Entertainment. Photo credit: K.C. Bailey. © 2011 Paramount Pictures. All Rights Reserved. Rated: PG-13 for some teen drug and alcohol use, sexual content, violence and language. Co-Writer/Director Craig Brewer ("Hustle & Flow," "Black Snake Moan") delivers a new take of the beloved 1984 classic film, "Footloose." Ren MacCormack (played by newcomer Kenny Wormald) is transplanted from Boston to the small southern town of Bomont where he experiences a heavy dose of culture shock. A few years prior, the community was rocked by a tragic accident that killed five teenagers after a night out and Bomont's local councilmen and the beloved Reverend Shaw Moore (Dennis Quaid) responded by implementing ordinances that prohibit loud music and dancing. Not one to bow to the status quo, Ren challenges the ban, revitalizing the town and falling in love with the minister's troubled daughter Ariel (Julianne Hough) in the process. 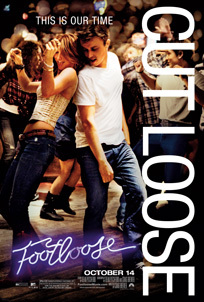 Paramount Pictures and Spyglass Entertainment present a Dylan Sellers Zadan/Meron Weston Pictures Production, "Footloose," starring Kenny Wormald, Julianne Hough, Andie MacDowell and Dennis Quaid. The film is directed by Craig Brewer. The producers are Craig Zadan, Neil Meron, Dylan Sellers and Brad Weston. Screenplay by Dean Pitchford and Craig Brewer is based on an original story by Dean Pitchford. The executive producers are Timothy M. Bourne, Gary Barber, Roger Birnbaum and Jonathan Glickman. The film is brought to life by a creative team that includes director of photography Amy Vincent, production designer Jon Gary Steele, costume designer Laura Jean Shannon and edited by Billy Fox. Kenny Wormald as Ren and Julianne Hough as Ariel in FOOTLOOSE, from Paramount Pictures and Spyglass Entertainment. Photo credit: K.C. Bailey. © 2011 Paramount Pictures. All Rights Reserved. Julianne Hough as Ariel in FOOTLOOSE, from Paramount Pictures and Spyglass Entertainment. Photo credit: K.C. Bailey. © 2011 Paramount Pictures. All Rights Reserved. Julianne Hough as Ariel and Kenny Wormald as Ren in FOOTLOOSE, from Paramount Pictures and Spyglass Entertainment. Photo credit: K.C. Bailey. © 2011 Paramount Pictures. All Rights Reserved. Miles Teller as Willard and Ziah Colon as Rusty in FOOTLOOSE, from Paramount Pictures and Spyglass Entertainment. Photo credit: K.C. Bailey. © 2011 Paramount Pictures. All Rights Reserved. Ray McKinnon as Wes Warnicker and Kenny Wormald as Ren in FOOTLOOSE, from Paramount Pictures and Spyglass Entertainment. Photo credit: K.C. Bailey. © 2011 Paramount Pictures. All Rights Reserved.